Matilda The Muscial London Official Source of all information. Get ready to catch the brilliant London show, Matilda The Musical at the magnificent Cambridge Theatre London. The enthralling show is a complete delight for people of all age group. The heart touching saga of a sweet innocent little girl who has some special power is a complete treat for the viewers. Experience the musical show at its best at the opulent Cambridge Theatre London. Based on the immensely popular classic novel by Roald Dahl, which has been admired by million of readers, is spectacularly presented and enlivened up onstage by Dennis Kelly. The hilarious comic musical has some of the brilliant catchy musical numbers by Tim Minchin. The central character is a little girl who has some extraordinary wit, intelligence and psychokinetic powers. The girl’s parents do not love her, whereas her teacher is quite impressed with her astonishing skills. During the course of her first term, both the teacher and the pupil have huge effect on their respective lives. The stunning show, Matilda The Musical is directed by Matthew Warchus. The brilliant show is the winner of seven 2012 Olivier awards which also includes Best New Musical. The two hours and forty five minutes is ideal for kids above six. Since the year 2011, Matilda The Musical is ruling the box office register and has won several awards and acclamations. In the year2012, the show went on winning record breaking seven Laurence Olivier awards, whereas the spectacular Broadway production won 4 Tony awards. 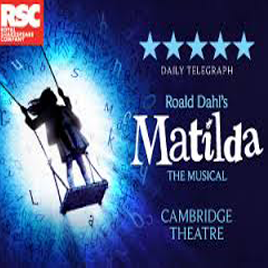 Experience the tale of Matilda and her life at the opulent Cambridge Theatre. Catch her survival amidst all adversities like her headmistress Miss Trunchbull. So, what are you waiting for? Experience the musical saga Matilda The Musical with your dear ones at Cambridge Theatre! Amazing show!!! Enjoyed every moment of this magnificent London show! Matilda The Musical is undoubtedly one of the best and beautiful presented British musicals. The show is adapted from the Roald Dahl’s novel Matilda. The novel was published for the first time in the year 1988 followed by hugely blockbuster movie version by Danny Devito in the year 1996. Royal Shakespeare Company commissioned this superb show, Matilda The Musical. The heart touching saga of unwanted daughter who later transformed into a prodigy is simply outstanding. I enjoyed the show thoroughly and found it immensely gripping and mesmerizing. Child actors are simply superb as they are handling various roles with ease and brilliance. In single word, Matilda The Musical is enjoyable and entertaining for all. A great show with a great performance. All the cast acted their characters with great pride and enthusiasm. The audience loved it and cheered loudly at the end. Saw Matilda here, which was a great show. I recently saw "Matilda" performed here. The views from nearly any seat would've been great. Comfy seats, lovely interior design to this historic theatre. My only complaint was that it was a bit cold. Even in January, I don't expect to keep my coat and scarf on throughout a performance. 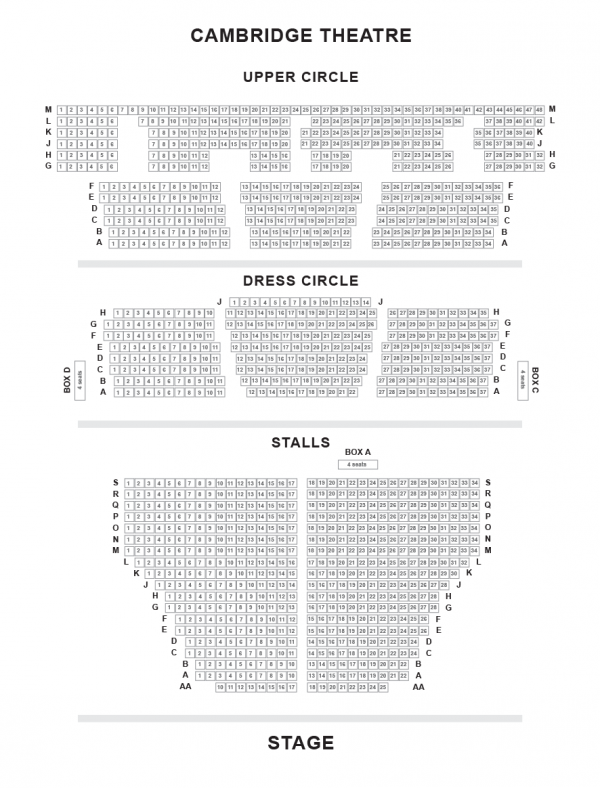 Enjoy the blockbuster London show Matilda The Musical at the magnificent Cambridge Theatre London! The show can be more enjoyable with exciting meal deal packages. These dining options are available at great discounted rates and most of the restaurants are at nearby distance. Located at a distance of 389 meters from the theatre, the restaurant is known for offering lip smacking and authentic British cuisine. Some of the major specialties of the restaurant are BBQ half rib racks and traditional beef burgers as well as fajitas and vegetable curries. For Italian food lovers, this is an ultimate destination. The restaurant is just at a distance of 361 meters and hugely popular amongst the theatre goers and tourists. You would be able to enjoy varied range of pizzas from all across the globe. Enjoy some authentic British cuisine with your dear ones at Porters. The restaurant is located at a distance of 335 meters and offers world renowned Porters Steak and Kidney Pudding, Fisherman's Pie still as creamy, the steamed syrup spong. 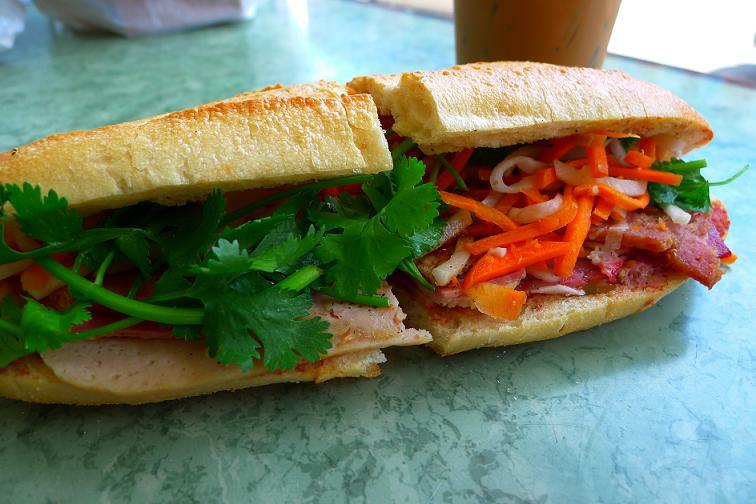 Enjoy mouth watering Thai food at Thai Square Covent Garden! With cool interior and contemporary designing, the restaurant is known for using Thai ingridients. Major highlights are Spring Rolls (V), Deep fried mushroom, vermicelli and cabbage, stuffed in rice pastry, served with sweet and chilli sauce, Tom Yum Hed (V), Hot and spicy soup with lemongrass, mushroom and fresh chilli, Chicken Satay Char-grilled marinated chicken satay served with peanut sauce, Giew Grob Deep-fried minced chicken and prawn wrapped with wanton skin, Tom Yum Gai, Hot and spicy chicken soup with lemongrass, mushroom and fresh chilli and many more. Positioned in the mid of the Docklands of London, the stunning luxury hotel is well connected with the city as it is just at 5 minutes walking distance from the Limehouse DLR Station. All the rooms are well furnished and finely equipped with all the modern day facilities. The hotel is fully equipped with wireless internet and has just 10 minutes drive to The O2 Arena in Greenwich, where you can enjoy live music and entertainment. Located near Hammersmith Underground, the hotel offers easy access to Central London and Heathrow Airport. Various modes of commutations are also available such as buses and taxis, which makes the travelling all across the city easier. With occupancy of well furnished 135 bedrooms and world class facilities, the hotel is a great place to stay for. There are various range of shops, bars, restaurants and theatres at a nearby distance from the hotel. Positioned in Leinster Gardens close to Bayswater, known for some of the finest shopping malls, financial districts and various other tourist attractions. The world famous Hyde Park is also located at a nearby distance. The hotel is ideal for both the business and leisure travelers. Within the walking distance of the hotel, Portobello Market in Nothing Hill, Westfield Shopping Centre and the Paddington railway station. The stunning 3 star hotel is set in a Victorian listed building situated in the quiet residential area of Bayswater. The stunning hotel is at a walking distance from Queensway’s shops, bars and restaurants. Within just a five minutes tube journey, you will be at the Oxford Street’s shop, whereas Buckingham Palace and its gardens are at a distance of 20 minutes by tube.